Last month, when the Senate passed an amendment to its immigration-reform bill that included $46 billion to beef up border security, Sen. John McCain declared: “We’ll be the most militarized border since the fall of the Berlin Wall!” He didn’t know the half of it. 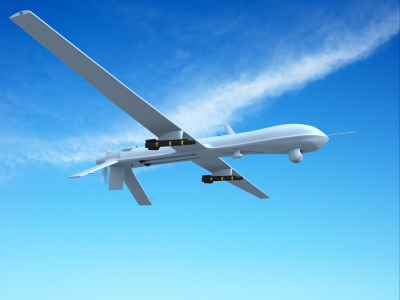 Since then, documents released as part of a lawsuit filed by the Electronic Frontier Foundation have revealed that the Department of Homeland Security has been preparing to fly armed drones along the border. A long-term-planning document prepared by the department’s Customs and Border Patrol service, which is using Predator drones for surveillance along the border, would authorize the use of “ nonlethal weapons designed to immobilize” targets of interest. That gets scarier when you thumb through some of the other newly released documents, which reveal that the Border Patrol plans to more than double its drone fleet over the next three years, to 24, and make them more easily available to other government agencies. Posted: 7/18/13 at 9:38 AM under FBI, News Story.